ab53444 detects surface CD68 at low levels in resident mouse peritoneal macrophages which can be enhanced with thioglycollate stimulation. Tissue, cells or virus corresponding to Mouse CD68. IHC-Fr: Mouse lung, spleen and heart tissue sections; ICC/IF: RAW 246.7 cell line. Flow Cyt: Mouse peritoneal macrophages. Although some customers have had success with this antibody in IHC-P, we are unable to obtain positive results in this application and so cannot recommend it for IHC-P. We batch test the antibody in IHC-Fr. Our Abpromise guarantee covers the use of ab53444 in the following tested applications. WB Use at an assay dependent concentration. Predicted molecular weight: 36 kDa. IHC-Fr Use a concentration of 0.1 - 5 µg/ml. Use 10µl of the suggested working dilution to label 106 cells in 100µl. Membrane permeabilisation is required for this application. Highly expressed by blood monocytes and tissue macrophages. 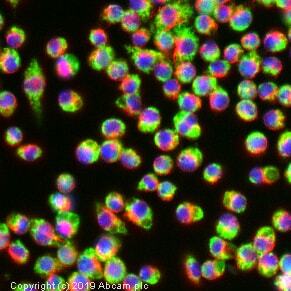 Also expressed in lymphocytes, fibroblasts and endothelial cells. Expressed in many tumor cell lines which could allow them to attach to selectins on vascular endothelium, facilitating their dissemination to secondary sites. Cell membrane and Endosome membrane. Lysosome membrane. Immunohistochemistry (Frozen sections) - Anti-CD68 antibody [FA-11] (ab53444)Lee J. et al PLoS One. 2017 Nov 2;12(11):e0187189. doi: 10.1371/journal.pone.0187189. eCollection 2017. Dual fluorescence combining IL-6 with markers for macrophages (CD68). O, P, and Q, dual labeling of IL-6 (red) and marker of macrophage (green) in db/db mouse heart tissues. Arrows in Q show the specific CD68 staining with absence of IL-6 staining. 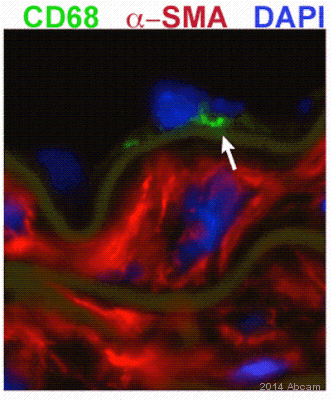 (R and S) Negative control: arrows show the absence of staining in vessels with control IgG and without primary antibodies. (T) Staining of nuclei with DAPI (blue) in heart tissues of the db/db mice. To identify and localize IL-6 protein in coronary arterioles, transverse sections of the mouse heart were stained using markers of endothelial cells, vascular smooth muscle cells, and macrophages. Freshly isolated hearts were embedded and frozen in OCT and sectioned at 5 μm. Slides were incubated with blocking solution (10% donkey serum in PBS) and permeabilized (0.1% Triton X-100 in PBS). Primary antibodies to IL-6 (goat polyclonal 15 micro g/ml, AF-406-NA; R&D) or macrophage marker CD68 (rat monoclonal, 1:1000, ab53444; Abcam) were used for sequential double immunofluorescence staining. Secondary antibodies were conjugated with the fluorophores FITC or Texas red. Sections were mounted in an anti-fading agent (Slowfade gold with DAPI; Invitrogen), and then the slides were observed and analyzed with a fluorescence microscope (IX81; Olympus) with a x40 objective (0.90 numerical aperture). For negative controls, primary antibodies were replaced with goat polyclonal IgG (Abcam), rabbit polyclonal IgG (GeneTex), and rat monoclonal IgG (Abcam) isotype controls at the same concentration. The specificity of the primary antibody was confirmed as the absence of immunofluorescence staining signals in the IL-6-/- mice. Formaldehyde-fixed, frozen mouse lung tissue sections stained for CD68 using ab53444 at a 1/250 dilution in immunohistochemical analysis. Tissue sections were blocked using 1% BSA as a blocking agent for 10 minutes at 21°C. Primary antibody was incubated for 2 hours at 21°C. Secondary antibody was a biotin-conjugated goat anti-rat IgG at 1/250 dilution. 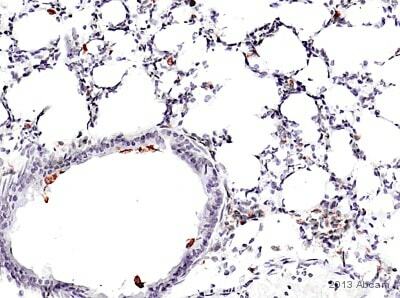 IHC image of CD68 staining in mouse lung frozen tissue section. The section was incubated with ab53444, 0.1µg/ml, overnight at 4C. A goat anti-Rat biotinylated secondary antibody was used to detect the primary, and visualized using an ABC system. DAB was used as the chromogen. The section was then counterstained with haematoxylin and mounted with DPX. 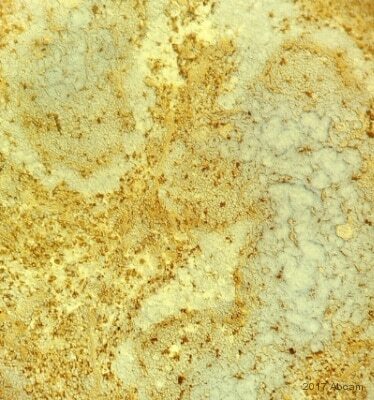 ab53444 staining CD68 in mouse spleen tissue by Immunohistochemistry (Frozen sections). Antibody was detected with HRP-conjugated Goat anti-Rat IgG, showing staining in the red pulp. ab53444staining CD68 in RAW246.7 cells. The cells were fixed with 100% methanol (5 min) and then incubated in 1%BSA / 10% normal goat serum / 0.3M glycine in 0.1% PBS-Tween for 1h to permeabilise the cells and block non-specific protein-protein interactions. 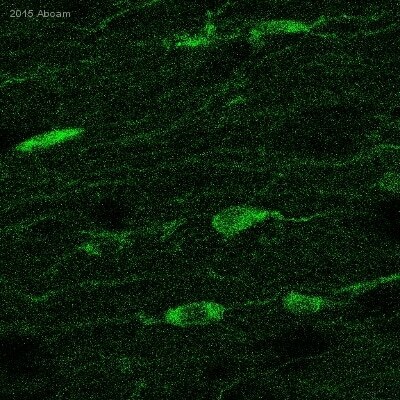 The cells were then incubated overnight at +4°C with ab53444 at 1ugml then detected with an Alexa Fluor® 488 goat anti-rat secondary antibody (ab150165) at a 1/1000 dilution (shown in green). Nuclear DNA was labelled with DAPI (shown in blue), and ab202272, Rabbit monoclonal to alpha Tubulin (Alexa Fluor® 594), at a 1/250 dilution (shown in red). Staining of permeabilised mouse peritoneal macrophages with Rat anti mouse CD68 (ab53444). 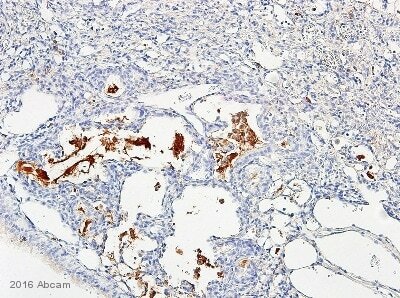 ab53444 staining mouse heart tissue by Immunohistochemistry (IHC-frozen sections). Tissue underwent fixation in paraformaldehyde, no permeabilization and blocked in 1% serum for 10 minutes at 20°C. The primary antibody used undiluted and incubated with sample for 16 hours at 20°C. A Biotin conjugated goat polyclonal to rat Ig, diluted 1/100 was used as the secondary. ab53444 at 1/100 dilution staining CD68 in mouse spleen tissue by immunohistochemistry (frozen sections). Sections were acetone fixed prior to blocking in 8% milk for 40 minutes at 36°C and then incubated with ab53444 for 20 hours at 4°C. A biotin conjugated goat polyclonal to rat Ig, diluted 1/400, was used as the secondary antibody. 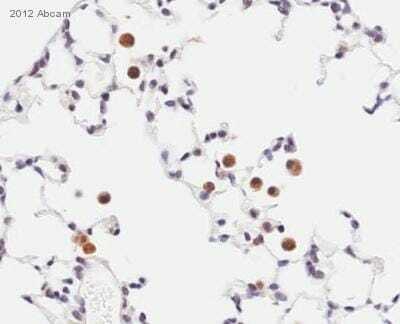 Immunohistochemistry (Frozen sections) - Anti-CD68 antibody [FA-11] (ab53444)This image is courtesy of an anonymous Abreview. ab53444 staining CD68 in murine heart tissue by Immunohistochemistry (Frozen sections). Tissue was fixed in acetone, permeabilized using 0.3% Triton, blocked with 10% serum for 30 minutes at 20°C, then incubated with ab53444 at a 1/1000 dilution for 16 hours at 4°C. The secondary used was a FITC conjugated goat anti-rat polyclonal, used at a 1/1000 dilution. Publishing research using ab53444? Please let us know so that we can cite the reference in this datasheet. Customer inquiring about immunogen sequence / blocking peptide for ab53444, ab9089, ab3283. Also inquiring about positive controls for CD47 and CD68 for IHC-Fr and WB and potential expression in spleen. As we discussed on the phone, the immunogen sequences for ab53444, ab9089, and ab3283 are unknown due to all 3 immunogens arising from tissue and cell preparations. For ab53444, the THP1 cell line that I mentioned on the phone would not be suitable as a positive control since it is a human cell line and ab53444 is raised against mouse CD68. I am sorry this product did not perform as stated on the datasheet and for the inconvenience this has caused. As requested, I have issued a free of charge replacement for one vial of ab125212.